When we look back at our homeschool journey, one of our favorite rabbit trail experiences revolves around an odd question out of context – “Are worms made out of metal”? Here starts a series of unintentional homeschool rabbit trails. The backstory, to have this question make more sense, and of course give the answer, started with a hole in the ground. Well, I guess the hole was more towards the middle of the story. It must have been a good 9 or 10 years ago, since our twin boys are now 16. Armed with a Discovery Kids metal detector along with an adult model, my husband was going to take the boys down the road to the far end of the pond to do some metal detecting, or “dirt-fishing” as they would call it. Robbie: Are worms made out of metal? Riley: (quite matter of factly) No, metal is made out of metal. Worms are made out of worm! With that, we decided we could delve a bit deeper. Not in the ground, but into what worms were “made of,” because “worm” isn’t completely wrong, just not quite specific enough. A couple of worm books later, we decided to purchase a huge earthworm for dissection. It was 50% gross and 50% interesting, but no metal was found. Mission successful, we solved the mystery of what worms are made of. This fishing trip also produced a couple of well-received rabbit trails. The town stocks the pond next to our house each spring for a community fishing derby. Each year, a large group of neighborhood kids gets together to see who can catch the largest or most fish in the morning. One year Riley had an 11 1/2-inch trout, the largest fish of the day for several hours before someone pulled out a 12 incher, literally 15 minutes before the event was over. But bringing home half a dozen fish ended up being super interesting. 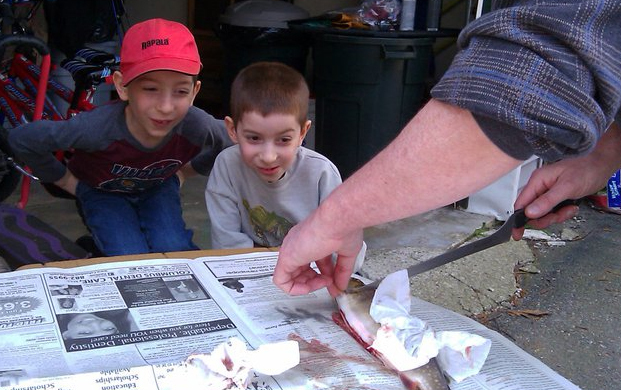 Typically gutting and cleaning fish isn’t the most pleasant task, but the boys really got into seeing what the fish were “made of.” This made for an impromptu trout cleaning/dissection, which lead to some internal organ and fish anatomy research. Rabbit Trail 3 – Fish to Sharks, Why Not? Of course, the pond and lake fish research quickly rabbit trailed to ocean shark research, because, why wouldn’t it? My husband loves sharks, and any excuse to look up information, watch shark week documentaries, buy fossilized shark teeth, etc. was pounced upon. Much of this even evolved into what would become the BYL Shark Unit Study. As much as we try to stay on topic, education happens. There are times that we must reel it in and focus on a task at hand. But other times we are much more flexible and open to diving in to explore. I’ve always been a big believer in striking when the iron is hot. If they are showing interest in a topic, don’t worry about waiting until it comes up in the lesson plans. They will learn best when they are excited. These are the lessons that stick with them for the long haul. That’s what real learning is! I’m always fascinated to see how their rabbit trails spawn even more trails – from metal detecting to worms to fish to sharks! You just never know where a rabbit trail might lead, but I promise it will always be an adventure.